Beauty and Woman Who Has Cut Off Her Hair, circa 1875 - Interesting illustration done for the "Nichinichi shinbun" newspaper in Osaka. 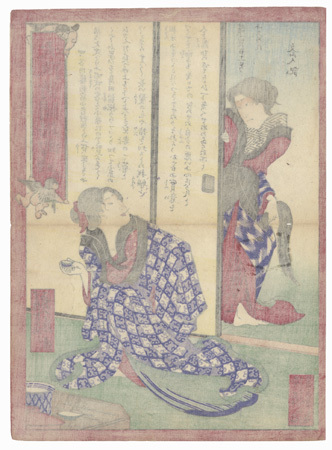 Popular during the Meiji era, these publications depicted often sensational contemporary events in the news, including murders, robberies, and assaults, as well as suicides, fires, natural disasters, battles and campaigns, and even supernatural occurrences. 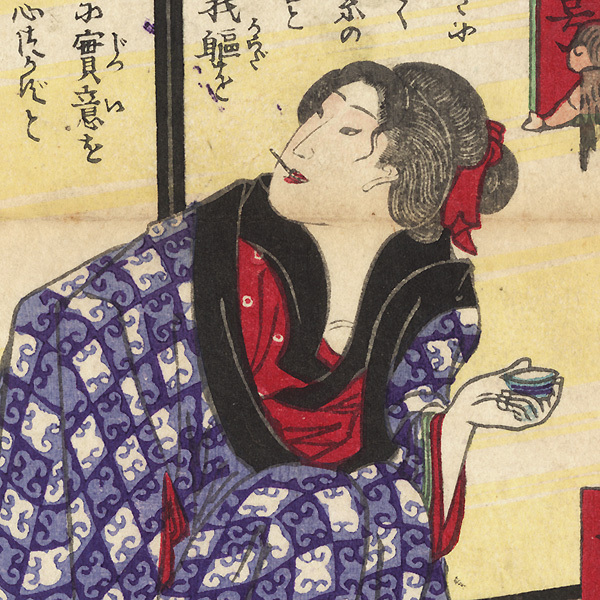 Here, a woman looks up from a cup of sake as her companion peers around the edge of a sliding panel, holding the long hair she has just cut off in her hand. While news illustrations for Tokyo papers are fairly common, this is the first one we've come across from Osaka. Image Size - 9 3/8" x 6 3/4"
Condition - This print with excellent color and detail as shown. Horizontal centerfold. Slight toning and soiling. Please see photos for details. Good overall.